Blog Quick Quotes: Thanks a Latte with Neva! Thanks a Latte with Neva! Welcome to the end of the month here at Quick Quotes! 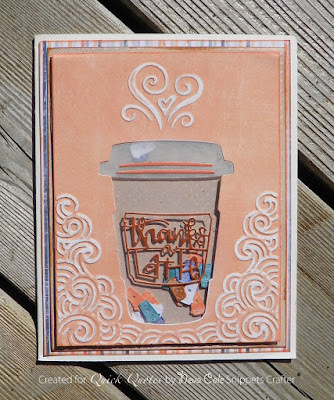 You may have noticed all the fun coffee themed projects and I am here to share a sweet shaker card with you. That's because we are playing along with the Spring and Summer Coffee Lover's Blog Hop. There's still time to play along - check it out here. 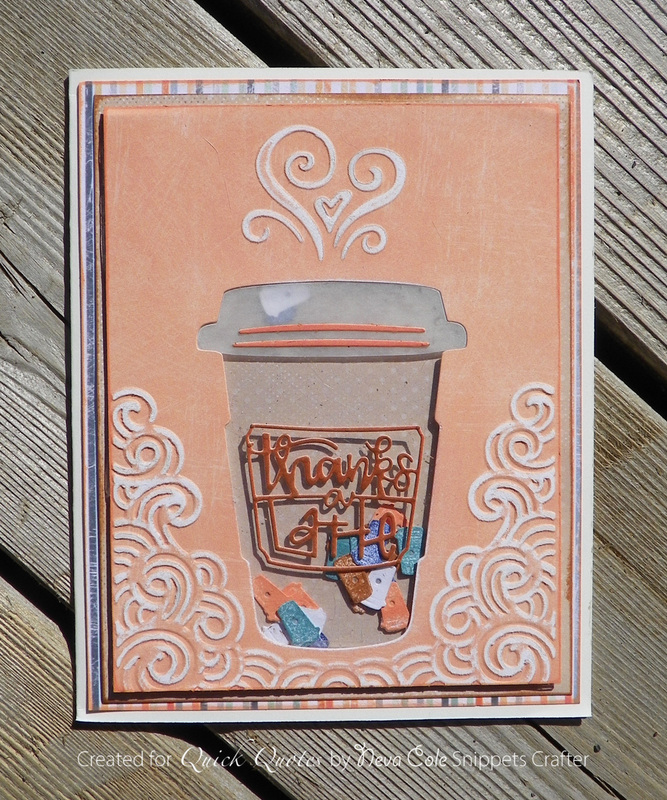 My "Thanks A Latte" card was created from a few papers from the Anchors Away collection. The inside of the shaker card has mini coffee cups which I think are so cute! Anchors Aweigh 101 is trimmed to 4 ¼” x 5 ½”. The paper is pressure embossed with a folder that also die cuts the coffeed cup at the same time. How cool is that? To bring out the embossed areas, a sanding block is used to sand away the color from the paper. Anchors Aweigh 104 is trimmed to 4 ½” x 5 ¾”. Anchors Aweigh 109 is trimmed to 4 ¾” x 6”. 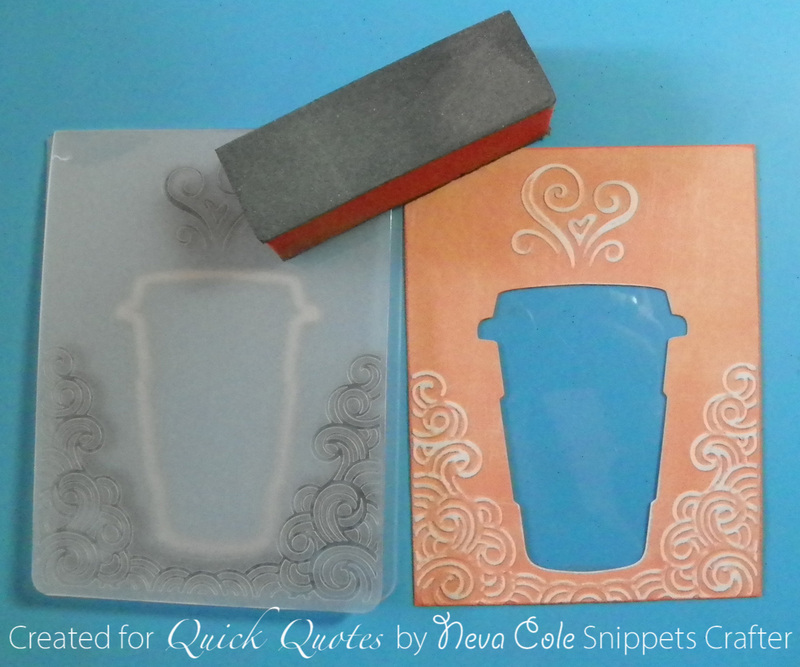 Embellishments are die cut from the scraps of the coffee cup. The die cuts are initially inked with PowderPuff Chalking Ink in Island Orange. Later (not shown) I inked the sentiment with Kokomo because I decided it need more contrast. All the rectangle sections are inked with Island Orange. Four ink colors, Island Orange, Kokomo, Deep Sea, and Capri Blue were used to ink the mini die cuts. Four mini die cuts were left white. 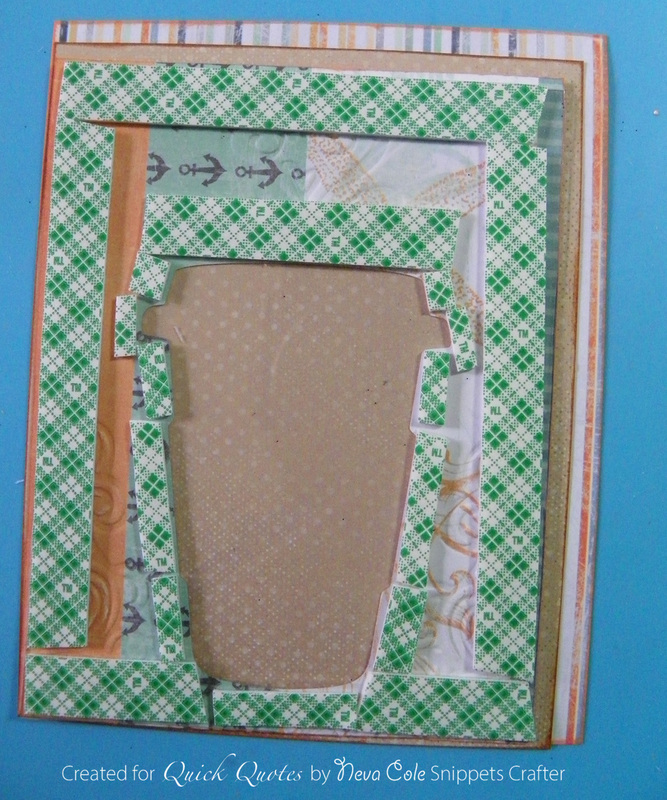 A section of re-purposed packaging is trimmed to 4 1/8” x 5 3/8”. The card front is adhered to the clear re-purposed packaging. 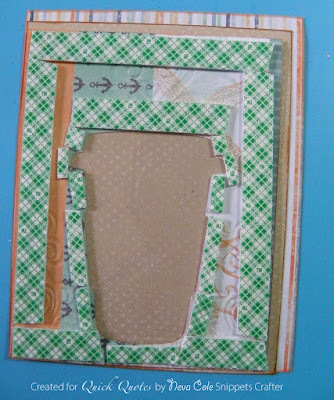 Foam tape is adhered around the perimeter of the card front and around the outside edge of the coffee cup. 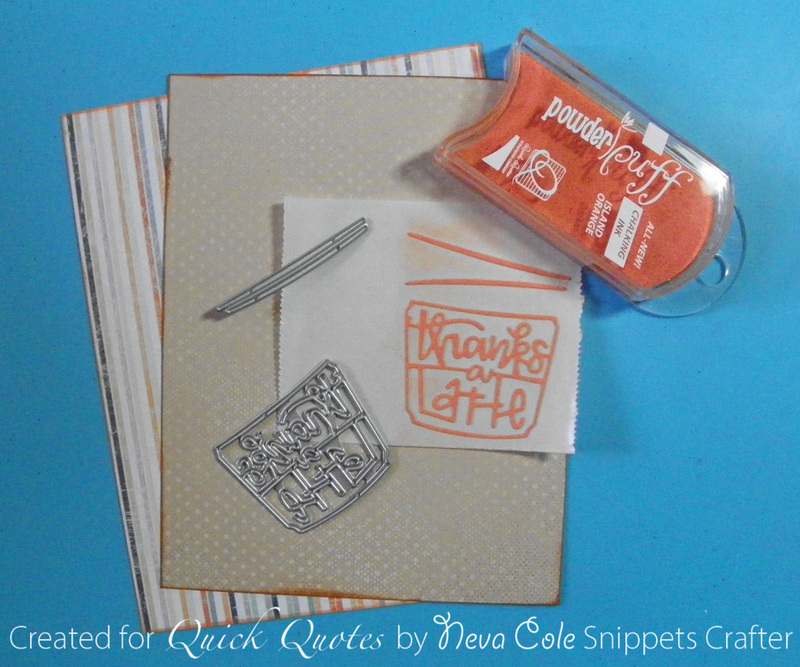 The mini coffee cups are placed in the shaker area and the card layers are adhered together. Vellum is die cut to add as a lid for the cup, with the slim die cut cup details adhered to the vellum. The sentiment die cut is adhered directly to the re-purposed packaging. All the card front layers are adhered to a 5” x 6 ¼” card base. I have card bases that are a standard 6-Bar (5” x 6 ½”) that I trimmed down to fit the card front. Thanks so much for stopping by today, I hope you have enjoyed this short tutorial on making a quick shaker card. Quick Quotes papers makes it easy to coordinate a wonderfully layered card. I had to click a lot of links to find your post, but I'm so glad that I did! 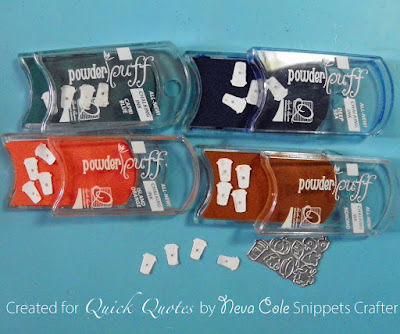 I really like the Anchors Aweigh paper colors, and those mini coffee cups make a wonderful confetti! I'd never heard of anyone sanding away the raised portions of an embossed card--benius! Thank you for sharing.